Simulation software for NC process machine operation training"PRO-CNC"
CREATION DESIGN INC. provides PRO-CNC, the best real machine simulation software. Simulation software "PRO-CNC" for NC process machine operation and verification is the machine simulation software which allows realistic training of CNC lathes and machining center operation, and of processing techniques. 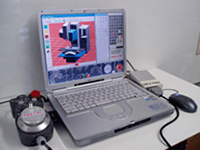 General perception of "Machine Simulation Software" is of a simple system which is included with CAD/CAM. However this PRO-CNC enables learning of operation, configuration, and driving of the machines in the virtual world that simulates real machines by real movement. * You can learn about operation method and processing technique of the CNC mechanic lathe and machining center more easily and safely with 3D simulation on a PC. * PRO-CNC simulates a real machine and let's trainee to operate a machine immediately after mastering PRO-CNC. * In addition to the simple processing simulation, a holistic CNC training can also be achieved through the operation of the machine and CNC controller. * Able to check collision and interference on a real machine for the G code. It is possible to have a NC program training that is more effective by verifying a processing state of work materials and acquisition of a high level processing technique. In addition, effective collaborative training with the existing CAD/CAM training is possible. * Achieve a high training efficiency by reducing the capital investment cost. * Perfect expression and representation by Virtual Reality. Perfect Virtual CNC Machine. It realistically portrays cutting powder/chips, cutting sounds generated at the time of a rotation, and the cutting of the main spindle. Coolant and tool exchange are also represented realistically. * Setting user-centric GUI (Graphic User Interface). Variety of views such as wire frame, enlargement/reduction, free viewpoint movement with a mouse. ○ What is machine simulation software PRO-CNC? 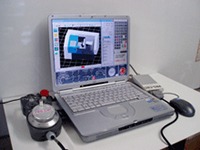 PRO-CNC is an abbreviation for Professional - Computerized Numerical Control virtual machine. PRO-CNC is a simulation software for NC process machine operation training that uses VR (virtual reality) technique used by people who want to become full-scale professionals of machine processing. There are 2 lathe models currently available: horizontal and vertical as shown below. 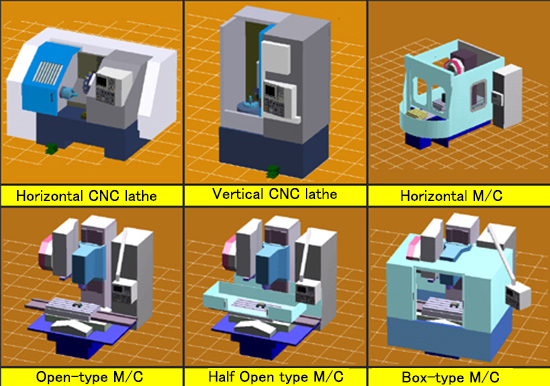 There are other machining center models for the vertical type such as Open type, Half Open type, Box type and horizontal form.